My love for Shetland knitted items goes back deep into my childhood. When I was 12, I fell in love with a Fair Isle sweater I had seen in a shop window and insisted on my mother buying it for me. It was the first time ever I had chosen a garment on my own! The sweater was expensive and handwash only, so I had to negotiate for weeks before my mother would agree to the expensive purchase. The deal was that she would buy it if I promised to wear it for a long time. I kept my word: the sweater is still in my closet, 30 years later. It has been darned several times. Eventually, I stopped wearing it because, after bearing 2 children, well...it doesn’t fit me anymore. 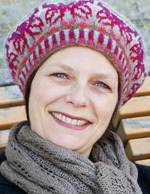 One day I will copy my much loved sweater using my handspun yarn. But before I commit to make from scratch a sweater meant to last another 30 years, I thought I would study the yarn carefully and practice spinning some for smaller items. You will see the sweater some day on my Ravelry page but in the meantime, here is the method I have come to for spinning Fair Isle knitting yarn. Vintage Fair Isle garments are fascinating because of the subtle color range they cover. To achieve this effect, yarn is made of thoroughly carded Shetland wool, in a wide range of colors, including many natural ones. This project takes advantage of the wide range of natural colors of the Shetland sheep, using only two color schemes for the stranded knitting: natural colors and reds. By blending all the reds from a few base colors, you are sure to attain the subtlety that is the trade mark of the better Fair Isle heirlooms. A small project like my Ogiku Tam uses a mere 2 oz (57 g) yarn. If you start with a 4.4-oz (125 g) sample pack of 5 natural colors plus a 3.5-oz (100 g) pack of white top, you will be perfectly on the safe side. Soak the fiber in lukewarm water with a few drops of dishwashing detergent for at least half an hour. Rinse and press gently. Cover your working space with plastic wrap and cut one large piece of wrap for each chunk of fiber. Lay each chunk of fiber on top of one length of wrap. beware of children: synthetic dyes may look like inviting drinks to them, but they are toxic. avoid discarding large quantities of dyestuff in your sink or outdoors (put it in a tightly lid bottle and keep it in a safe place for further use). Measure or weigh 0.04 oz (1 g) dye powder. In a plastic glass or bowl, add two spoons hot water and paste thoroughly. Then add 0.4 cup (100 ml) hot water and mix. Dyestock can be stored in plastic bottles for several months. This project requires no color mixing. 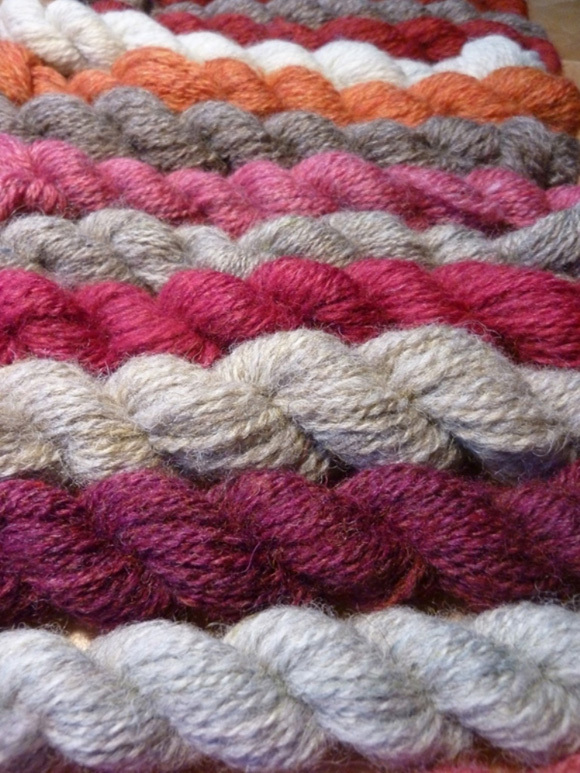 To get the special heathery look of Shetland yarn, you will blend colors by carding them instead of mixing the dyes. Blending always tones colors down, that is why I recommend dyeing bright saturated colors in the first place. They may not appeal to you, and they will be very far from the subtle shades of Shetland knitting, but don’t worry, this will come in time! Use pure dyestock in the following colors: yellow, hot pink, purple, blue and scarlet. Apply the dye by painting spots on the wet fiber with a stencil brush. Clean your stencil brush with water when changing color. You may need to paint both sides of the top to get an even distribution of color. But the fiber will be carded anyway and white spots won’t show in the end, so don’t waste your time on the painting job. Spray generously with white vinegar. Fold the wrap, seal both ends and roll. Stack all the rolled packs into a microwave safe dish and cook at 800-900 w, 3 times 3 min, at 10min intervals. Very carefully open the wraps: beware of the steam that will come out! Let cool naturally. When the fiber is at room temperature, rinse in lukewarm water, without agitating, until the water is clear. Gently press in a dry towel and hang to dry. Now comes the fun part, where you will card colors together to produce two whole ranges of colors ready to spin. I use my drumcarder, but you may as well use handcards, because you are dealing with very small amounts of each color. It is a very simple and intuitive process: all you need is to card different colors together several times, so that they blend together. Start with the main color and add contrasting colors in small quantities. Card once. Remove from the carder and divide the batt in two. Card a second time. Divide. Card a third time and fine tune the color. If needed, card more, until your batt is evenly blended. Depending on your dyeing, your color blends will come out different and it is not easy to give exact proportions (weight indicated here are a minimum). Here are rough guidelines to blend the 2 color ranges you need in this project. Check each color range displaying the batts side by side. You want them to match but also to look different from each other. If two batts look too similar, fine tune adding very little amounts of contrasting colors. Stay modest but confident. You are not trying to equal Ms. Starmore or other Fair-Isle geniuses at first, you are just playing within simple ranges of colors, that will probably match beautifully whatever you do. And remember that naturals come directly from the sheep: however bad you think you are at colors, you simply cannot spoil those! Start with small quantities of contrasting color. For instance, if you add purple to a base of red, start with half the amount of purple you think you need. Card once or twice, compare with the other shades in the color range, and fine tune adding more purple if you feel so inclined. You can always add a contrast color, but removing it is impossible: all you can do is trying to drown it in a large amount of the main color or put your blend aside and start again from scratch. The special look of Shetland yarn results from thoroughly blending several colors together, including neutrals. You will be able to change a shade of red dramatically adding yellow or pink. But remember that you still want red: don’t overdo the blending as far as changing hue. Elongate each batt. Spin ratio 8:1 with a semi-worsted method (trapping air within the yarn). You can spin several colors on the same bobbin, alternating sequences of contrasting colors (for example orange red/gray/dark pink red/light tan, etc.). Regularly check the thickness of your single. To do this, attach a piece of commercial Shetland yard (Jamieson Spindrift or another brand of Fair-Isle yarn) to your wheel. Let an arm length of your single ply on itself, cross it over your test yarn, close your eyes and slowly slip your hand along both. Your hand will feel differences in thickness that your eyes would not easily see. 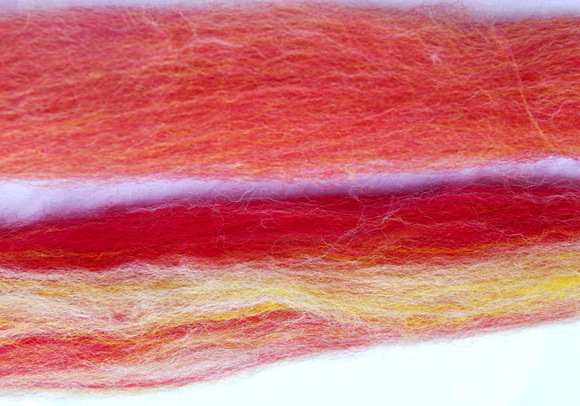 Remember that Shetland wool tends to bloom a little when washed, so avoid spinning thicker than your test yarn. Slightly thinner would be safer. Make a center pulled ball for each color and ply at the same ratio as spinning. Wash, press in a dry towel and hang to dry naturally. Admire your homemade Fair-Isle kit and knit with it!